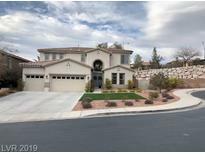 Below you can view all the homes for sale in the Granite Hills subdivision located in Henderson Nevada. Listings in Granite Hills are updated daily from data we receive from the Las Vegas multiple listing service. To learn more about any of these homes or to receive custom notifications when a new property is listed for sale in Granite Hills, give us a call at 702-323-5903. Recently Updated & Remodeled To Reflect The Current Trends* A Entertainers Delight W/A Salt Water Tropical Lagoon Pool W/ Solar Heating* A Patio Cover W Large Outdoor Basketball/Sports Court* Kitchen Is A Chef's Delight* This Home Is A Must See, Dont Miss!! ! MLS#2076637. Synergy Sothebys Int'l Realty.